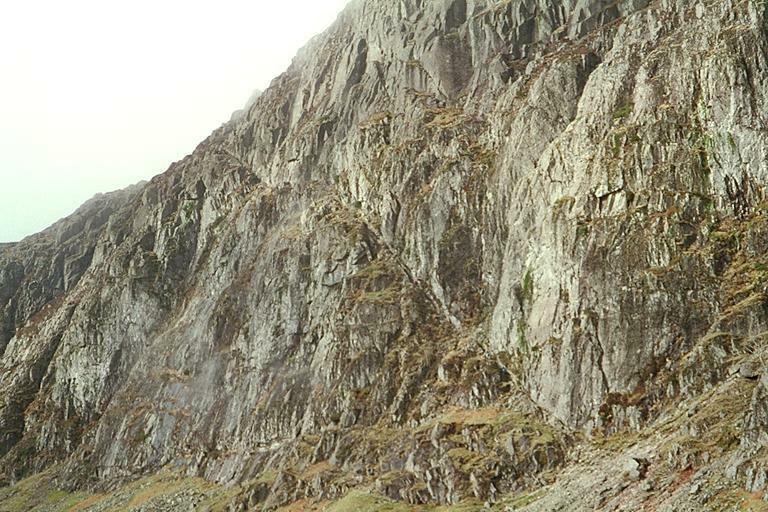 This is the lower part of Jack's Rake, seen from east of Stickle Tarn. It rises diagonally up from the lower right of the picture. Wisps of cloud obscure the path at Gwynne's Chimney, the only exposed part of the ascent. The path levels out at this point, above a steep grassy slope, and continues at a more gentle slope thereafter. The Pinnacle which marks the end of the ascent can be made out through the mist. The path to Easy Gully rises to the right from the start of Jack's Rake. Smaller version of this picture.